You can now top-up your Student Leap Card at the NUI Galway Students’ Union office! Please note all the below fares are the Student rates for the Student Leap Card only. Go to studentleapcard.ie and complete the online application. Bring the order confirmation code to the SU office along with your Student ID or a letter from your School/College and we can print the card off for you. Please note the code expires after 7 days. The Student Leap Card costs €10 and doesn’t have any credit on it. There are two options for topping up your Leap Card with credit in the SU Office and we don’t charge any commission! If you are looking to use the pay-as-you-go option you can top up your Student Leap Card with Travel Credit to the value of your choice. The fare when using the pay-as-you-go on Bus Éireann would be €1.68 a trip for bus trips in 01-11 stages and €1.98 for the 12+ stages. The Students’ Union Office is located upstairs in the Áras na Mac Léinn building (beside Sult) and we are open 10am-5pm Monday-Friday during term time. The NUI Galway Students’ Union Freshers’ Fair is back with ALL THE FREEBIES! Call down to Áras na Mac Léinn 11am-4pm Tuesday 18th of September 2018 for giant inflatable games, food, freebies, tunes from Flirt FM and competitions. List of Private Bus Companies to Galway. If your destination is not listed please check Bus Eireann or Irish Rail for alternative routes. Irish Rail and Bus Éireann will only recognise the NUI Galway Student ID for 4 years from date of issue. They take the first two digits from your student number as the date of issue. If your card is more than 4 years old or you are a returning student and are using your original student number you will need to purchase a Student Leap Card in order to get discounted travel with Irish Rail and Bus Éireann. You can purchase a Student Leap Card from the Students’ Union office for €10 just apply online here for your code first. You can find more information about Irish Rail’s Terms and Conditions here. You can also now top-up your Student Leap Card with credit in the SU Office. More information HERE. We sell tickets for all national routes. Apply online for your Student Leap Card HERE then call in to the SU Office with your code and we can print the card straight away for €10. Please note your code will expire after 7 days. Please call to the Students’ Union office upstairs in Áras na Mac Léinn for these services. We are open Monday-Friday 10am-5pm during term time. If you are still not registered to vote there is still time! We have the forms up here in the SU Office for you to fill out, get stamped at the Garda Stationand return to your City or County Council. You have until Tuesday the 5th of May to get your form to your City/County Council. DO IT! Although your card will still work in September, points cannot be carried forward to next year. Have you or someone you know left college before finishing? We would like to know why. Please fill out the survey below. The information you provide can help us better provide for students in the future. We now have €10 NUIG student tickets on sale for the last Connacht home match of the season against the Ospreys at 3pm Saturday 16th May. Please remember to drop your locker keys back to the Students’ Union Office by 5pm on Friday the 15th May 2015. Any items left in your locker after the 15th May 2015 will be disposed of. You can now collect your Alive Volunteering Certificate from the SU Office Monday-Friday 10am-5pm. Blood Donation clinics will be held 5pm-8.30pm on Tuesday 5th, Wednesday 6th and Thursday 7th of May in the Clayton Hotel, Ballybrit. Galway City Tidy Towns clean up takes place this Monday, 4th May, at 11am, meeting at the bridge beside Millennium Children’s Playground near Galway Cathedral. Volunteers are needed to help remove paint and graffiti. Pint of Science FREE Tickets! Pint of Science is taking place on Monday 18th and Tuesday 19th of May in the Oslo in Salthill. There is a great line up of speakers from NUI Galway tackling the themes of Our Body and Technology & Planet Earth over the two evenings. You can register now for your free tickets for the event here. Germany through my Lens is a photography competition organised by the Discipline of German at NUI Galway and the German Department at GMIT. We are asking students, registered for 2014-15 at NUI Galway or GMIT, to submit any photo they have taken themselves of any aspect of Germany that impressed them. Deadline for submissions is 15th September 2015. Are you travelling abroad this summer as part of your course, your research, a placement, volunteering? Then come along to the NUI Galway Pre-Departure Training to gain valuable insights, information and supports at 9.15am on Friday 15th May. To Register please fill in our short online form: here. Massage, Soccer, Reflexology, Acupuncture, Meditation, Breakfast in a Bag and more! The next Postgradaoke night will be from 8pm tomorrow Friday the 1st of May. 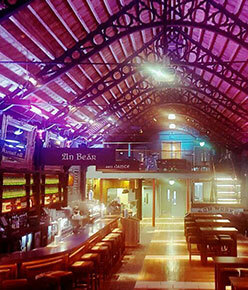 Swing along to the College Bar for karaoke, craic and all that stuff. It’s free to enter, it’s completely anonymous, and you’ve already done the work – you have nothing to lose! Join the NUI Galway Clubs and Societies in opposing the proposed N6 Galway City Transport Project. The SU Office, the Student Health Unit, SU Cloakroom, The College Bar, Caife na Gaeilge and SU Engineering Desk will all be closed on Monday for the Bank Holiday. The Library will be open Monday 4th May 08:30-22:00 but the service desk will be closed. Smokey’s Café will be open 09:00-17:30 Saturday 2nd, Sunday 3rd and Monday 4th of May. The Wall Café will be open 09:00-17:30 Saturday 2nd, Sunday 3rd and Monday 4th of May. The Hub Café, Computer DISC, the Academic Writing Centre and SUMS are all now closed for the summer. Our office is located upstairs in the Áras na Mac Léinn building beside the College Bar and we are open Monday to Friday 10am-5pm.